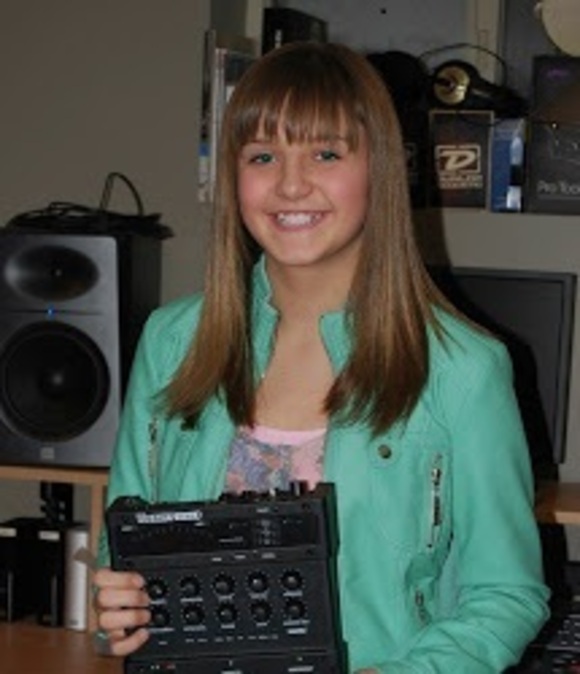 SALT LAKE CITY, Utah – She might be just 13, but Park City, Utah-based Sophia Dion is already well into her professional music career. Combining folk, pop and country influences, she started playing guitar at age 10 and while on a trip to Nashville was discovered by the owner of a guitar company who signed her to a performing artist deal. She’s played on stages with Reese Wynans, Tracy Nelson, John Oates, Ashley Cleveland and other artists – and recently discovered the benefits of HARMAN’s DigiTech Vocalist 3 harmony synthesizer and effects processor. The Vocalist 3 provides three-part harmony and real-time pitch correction and automatically follows a singer’s vocals and the chord progressions they’re playing. There’s no need to pre-program a song’s key changes to create accurate harmonies, making it ideally suited for live performing. For performers like Dion, the Vocalist 3 facilitates greater musical expression, especially when doing gigs as a solo performer without a backup band. The Vocalist Live 3 automatically follows a singer’s vocals and the chord progressions they’re playing using patented musIQ® technology. MusIQ eliminates the need to pre-program the song’s key changes, making it easier to use than other vocal processors. The Live 3 also provides a number of different vocal effects, EQ and pitch correction to help give vocals a professional studio-quality sound.